The parents kept their 13 children, ranging in age from two to 29, shackled to their beds in "foul-smelling surroundings." On Sunday afternoon, police in Perris, Calif. received a horrifying call. A 17-year-old girl told them that she had just escaped from a local residence where she claimed her 12 brothers and sisters were being held captive by their parents. After picking up the girl, sheriff’s deputies went to the home and found that the girl had been correct. Twelve victims were found in the home, shackled to their beds with chains and padlocks, all extremely dirty and malnourished. The girl who had called 911 was 17 but appeared to be no older than 10, and police were shocked to find out that of the 13 people they had found, seven were adults. In total, the victims ranged in age from two to 29. 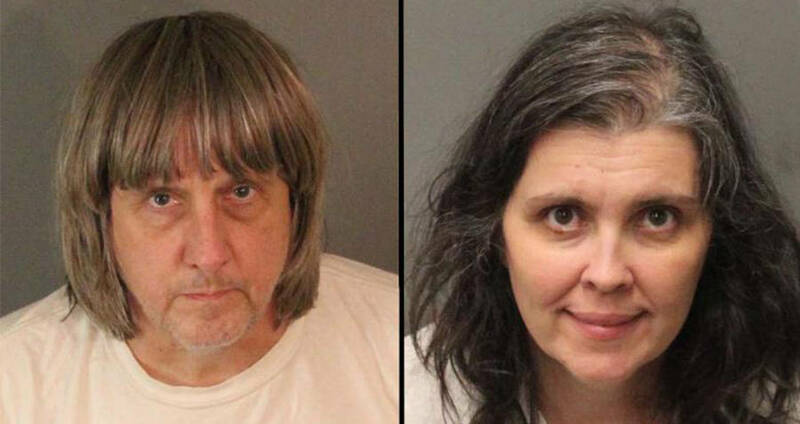 The parents, David and Louise Turpin, had no reasonable explanation for the conditions in which the children were found, and were immediately arrested by police. Their charges include torture and child endangerment, and a bail of $9 million was set for each of them. The victims were all given food and water after they claimed to be starving before the children were taken to the Riverside University Health System Medical Center, and the adult children to the Corona Regional Medical Center. CNNThe Turpin family on a family outing. 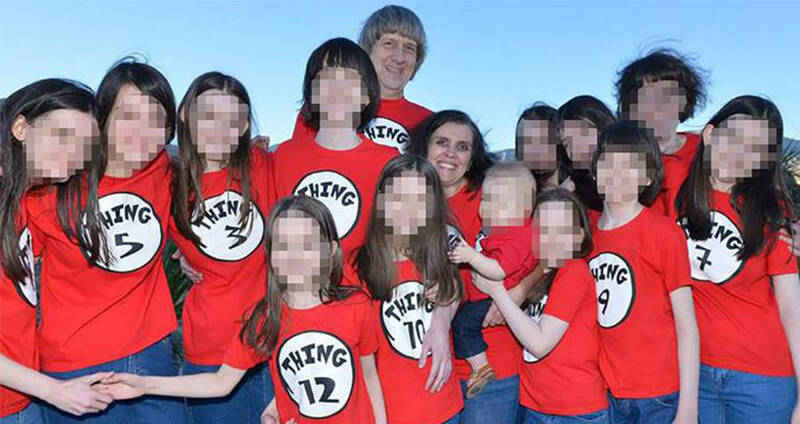 According to CNN, friends and neighbors of the Turpins were shocked to hear of the situation. Photos shared on social media show the family smiling and dressed alike in Disneyland and out for birthday celebrations. 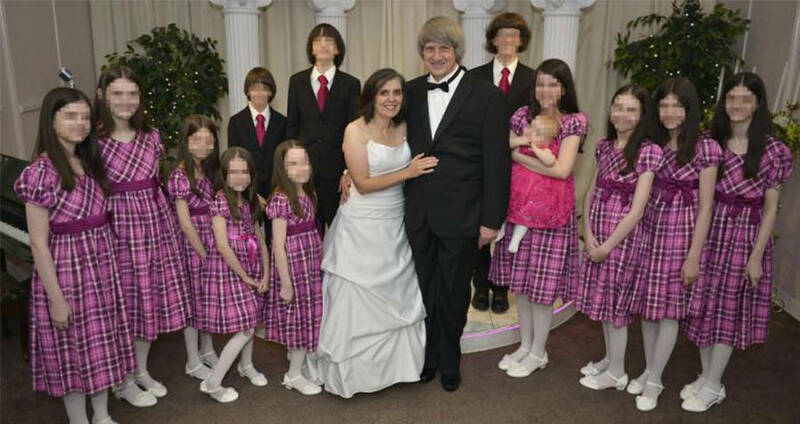 The Turpins also posted photographs of the family during three separate vow-renewal ceremonies, in 2011, 2013 and 2015. Friends say that the couple brought the entire family along to the Elvis Chapel in Las Vegas to renew their vows. In photos from one of the later ceremonies, the children all appear to be smiling, the girls dressed in identical purple plaid dresses and white shoes, and the boys in matching suits and purple ties. Mrs. Turpin admitted, however, that she hadn’t seen her grandchildren in person for almost five years, and that while she spoke with her son and daughter-in-law over the phone, she hadn’t spoken to the children at all. The neighbors seemed equally as surprised, saying that they knew a large family lived there, though none of them had ever seen the younger children in person. One neighbor claimed to have seen the older children working in the yard together, but described them as “very pale-skinned, almost like they’d never seen the sun,” and said that they all stuck together. The Turpin family at a vow renewal ceremony. The bankruptcy documents state that the Turpins listed $150,000 in assets, and were $240,000 in credit card debt. The documents also state that David Turpin made $140,000 a year as an engineer at Northrup Grumman, and Louise Turpin was a “homemaker.” According to the California Department of Education, however, David Turpin is listed as the principal of the Sandcastle Day School, which he operated out of his home beginning in March 2011. Betty Turpin claimed that her grandchildren were homeschooled at David Turpin’s school. The children are currently being treated at two separate medical centers, while the parents await their court hearing on Thursday. It is not apparent whether or not the Turpins have attorneys, or whether they have entered a plea. Next, read about the state that took kids away from their parents due to low IQ’s. Then, read about the 14-year-old boy who was rescued after a lifetime of imprisonment..